Keen eyed readers will note the new header picture above, featuring The Big Kahuna’s brand new paint job! While the old paint scheme was in pretty good condition, the “rabid Cleveland Browns fan” look was never going to be “us,” and the mural on the back had no relevance to our lifestyle. Once we finally sorted out the engine, auxiliary, and house systems, we felt we could finally move on to some of the less critical but nice to have projects. We had planned to have just the orange and brown stripe converted to a teal shade in Portland before we began our volunteer stint at Cape Disappointment, but that did not work out, and worse we had a partially sanded Kahuna looking particularly wretched. As it happens, a fellow camper at Cape D chatted us up about our bus, and strongly recommended we look in to On Time Painting in Portland to do the job. We made inquiries during the few times we had cell and internet connectivity at Cape D, and received a fantastic estimate, $1950, for doing not only the stripes but also all of the white, taking it from the off white, nearly cream to the brilliant pure white you see above. Our lead painter, Bruce, got the job done in just over three business days despite a crammed packed lot full of other rigs awaiting work. 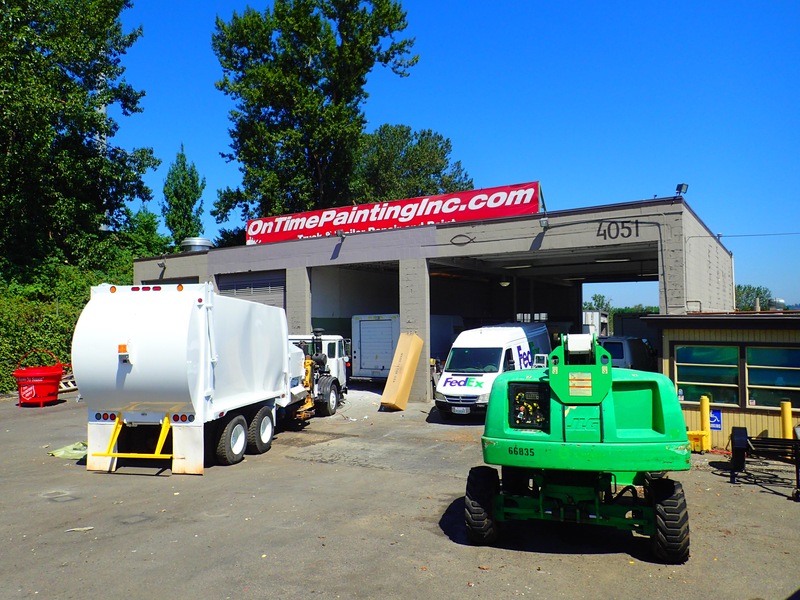 On time painting is not a car painting place, it is industrially focused, for trucks and big rigs. They had Fed-Ex delivery vehicles and full size semi haulers all over the place. I don’t know what one of their high end paint jobs would cost or look like, but we made it clear we were looking for basic truck type paint, not automotive show quality work, and they delivered. We brought in a teal color sample from Behr’s extensive interior paint rack at Home Depot, and OTP color matched it with their $10,000 machine and software. We defaulted to pure white we could see on a freshly painted Fed-Ex truck. On Time Painting had to do about $650 of prep work that was not included in their sight unseen estimate, but it was not unexpected as we had discussed the rough spots that would require significant grinding down and filling on the phone and that they would need to see it to account for that work. They also did a quick repair and paint job to two of the storage doors I scratched up rather badly getting into their lot. Bottom line, For $2600 On Time Painting gave us brilliant new polyurethane paint on 3/4 of our bus. We will definitely come back to them if we decide to update the silver on the lower sections. So, what do you think of the new color scheme? 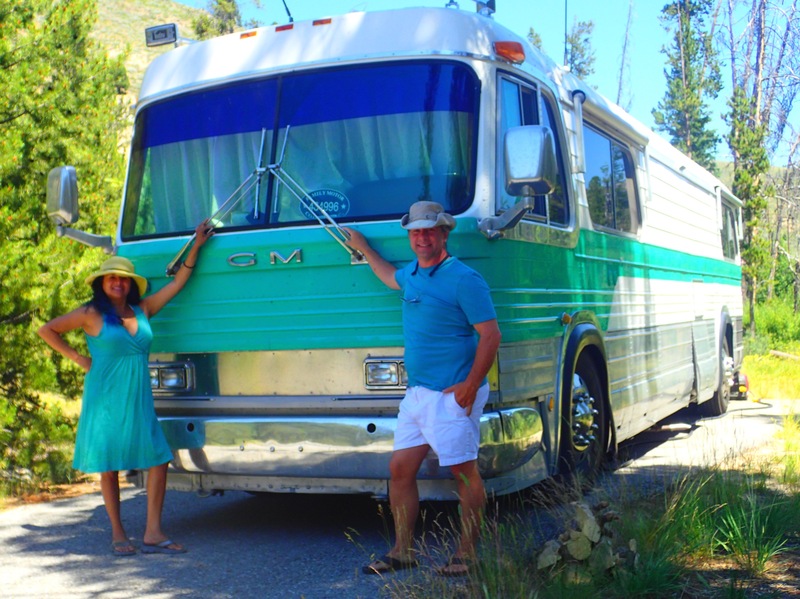 Love the paint job … And your blog. Thanks for sharing with us 😛! Love from the Blaser Family! Thanks Patty, great to hear from you. Paint job is gorgeous! I’m a bit disappointed to have read little of Cape Disappointment! Tell us about it. How was the volunteer work? Any disappointments or did it fail to live up to its name??? Its coming I promise! We are just a bit behind on posting our stays. Are you in Chicago now?